Recovering after a hurricane has passed through your area is never easy. Anyone that has experienced or has loved ones that have experienced Katrina knows this. Hurricanes can be devastating and can leave behind all sorts of destruction …on people, as well as property. So the hurricane has blown through your area and wreaked havoc, now what do you do? Here are some things you need to be aware of after a hurricane has done its damage in your town. With regards to food, don’t eat anything that has come into contact with storm water, it could have all sorts of bacterial contamination and it could make you very sick. If you lose power, keep your refrigerator door shut as much as possible in order to keep the food inside cold. Consider adding dry ice if you think your power is going to be off for more than 4 hours. Pay attention to the emergency weather channel with regards to water and whether the water that is coming out of your tap is safe to drink or even to use for bathing or cooking; sometimes it is not. Ideally, you will have bottled water on hand. Make sure you follow whatever directions are given for purifying your water — whether that be boiling water or using water purification tablets. 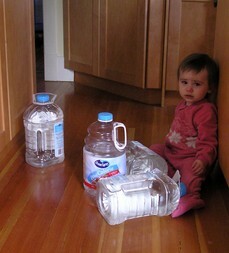 Babies should not be given water that has been treated by boiling or purification tablets. Instead, use pre-prepared canned formula. You would think it’s common sense to be aware of carbon monoxide poisoning, but many people make the mistake of using charcoal grills, or camp stoves inside their homes during or after storms. This is very dangerous because they can give off carbon monoxide, and since it’s odorless and colorless you will not know the deadly gas is there until it is too late. While this is not always possible, you should avoid flood waters whenever you can. If you must work in or around flood water, wear a lifejacket or other flotation device — just in case. 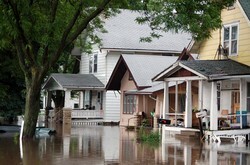 Flood waters have been known to crack foundations, and even cause walls to collapse inward. Anytime water is around a building that you want to enter, don’t go inside. If that’s the building you live in… get out. If you simply have water in the basement, then pump it out gradually. If you do it all at once, any water that is outside and around the building could make the walls in your basement collapse inward. Finally, be aware that where there is flood water, there are also mosquitoes. Wear long pants, shirts, socks and an insect repellent with DEET or Picaridin to help prevent bites from disease carrying mosquitoes. Drive only if you have no other recourse, but don’t drive your car through deep standing water. I’ve seen people getting caught in their cars and having to climb on top of them just get above the water! 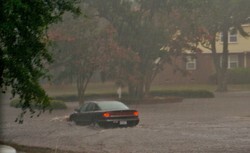 Especially if the water is moving rapidly, cars can be swept away in relatively shallow water. If you are somewhere safe, then stay there until you hear on the emergency weather channel that it is safe to leave. Avoid downed powerlines. Even if a downed power line looks harmless, avoid it — it could easily still be live! Call your local power company if you find downed power lines. Also, stay away from overhead power lines when you are doing clean up after a hurricane. On a related note, if any of your electrical circuits or equipment gets wet or is submerged in water, turn off the power using the main breaker or fuse box and don’t turn it back on until an electrician has looked things over. Mold can cause serious illness in people, so dry out your home right away — as soon as the water has receded in order to prevent mold growth. Open windows, use fans, and wipe down surfaces with water and detergent to prevent the growth of mold. If you do get some mold, use a mixture of 1 cup of bleach to 1 gallon of water to clean it up. Throw out any porous items that are not going to dry out quickly, as they can easily become moldy. Check your home for gas leaks. If you hear a hissing sound or smell gas, get out of the building immediately! If you can, turn off the gas from the main valve outside and call your local gas company. Only someone from the gas company can turn your gas back on, once it has been turned off. When doing cleanup after the storm, be sure to wear protective clothing such as gloves, boots, long pants, long-sleeve shirts and goggles — to name a few items. These will help you to stay as uninjured as possible while you clean up your building, and around it as well. Many of these tips are common sense for those of us who live in areas that sometimes have flooding, but there are many who may not know — particularly if they’ve just moved to an area and experienced their first hurricane. Keeping these things in mind in the aftermath of a hurricane will keep both you and your loved ones safe.